10. Adam and Eve (GENESIS CHAPTER 2): this costume is a couple classic and pretty much a thing at every adult Halloween costume party that you will go to, Christian or not. 9. Balaam’s Donkey (NUMBERS 22: 21-39): What a talking Donkey! Take this costume a step up by having your BFF dress as a sorcerer (Balaam) and beat you with a whip all night. 8. 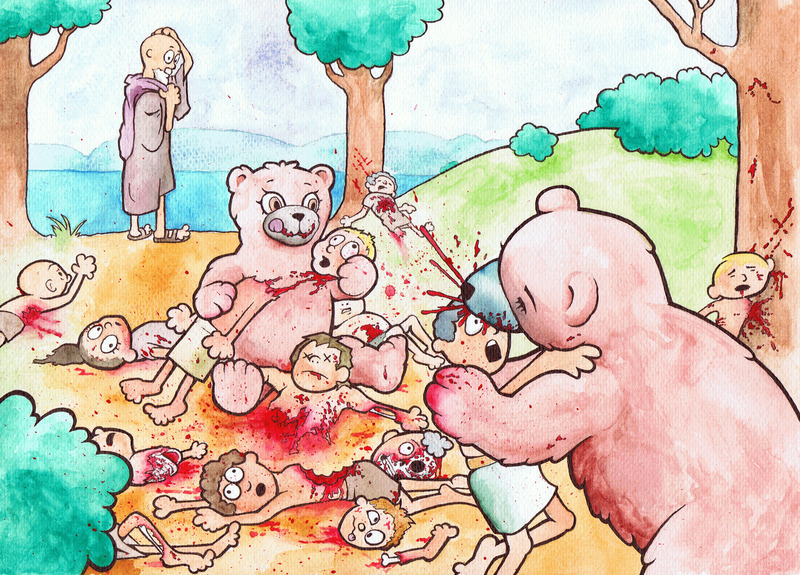 Mamma bear (2 KINGS 2:23-25): Going with the animals in the bible theme, how about the bear that the prophet Elisha has maul a group of teens that are making fun of him for being bald. Get a bear costume and dress it up with a severed arm. 6. Eglon king of Moab (JUDGES CHAPTER 3): Wear a fat suit and have the top of a sword come out of it. Your friend can go as the prophet Ehud. 5: Egyptian Covered in Boils (Exodus chapter 9): For this you will need and Egyptian costume and to be covered in boils. 4: Drowned Egyptians (Exodus Chapter 14): For this you will need an Egyptian costume a pale blue is face and probably oil of some sort to give you that wet look. 3: Demon-Possessed Man (Mark chapter 5): Think a hulk out fit with broken chains on your hands and feet. 2: Defeated Goliath (1 Samuel 17): Dress like an ancient solider and create a wound in the middle of you r forehead, next level this costume by making it look your head has been severed. Alternatively go as David carrying a severed head. 1: Zombie Lazarus (John 11:38- 34): This is what I am going to be this year. Dress like a mummy with an exposed face, painted white. (Technically he was not a zombie but he was raised from the dead). Best ideas for Bible costumes ever!! !